Every year since 2004, the Supreme Islamic Iraqi Council (hereafter the Supreme Council*) has marked the anniversary of the 29 August 2003 assassination of its former leader, Muhammad Baqir al-Hakim, in accordance with the Islamic calendar. This year, the 2 Rajab commemoration fell on 17 July. 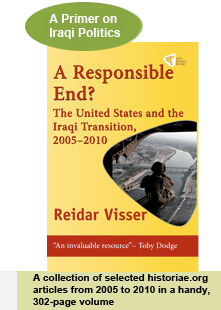 In 2005 and 2006 these celebrations were turned into propaganda events for the novel idea of a single federal Shiite entity extending from Baghdad to Basra… Full story here.